Whether you’re thinking of shopping on one of Europe’ busiest streets by number of visitors, you probably were thinking of Oxford Street! For decades, Oxford Street has been the ‘go-to’ shopping street in London with retail development starting back in the 1900’s. The 1.5-mile-long street once upon time was the main road to Oxford, back then called Tyburn Road. Now with over 300 stores including some of the most known stores such as John Lewis or Selfridges, Oxford Street is visited daily by around half a million people. What’s more there are rumours of a secret underground street beneath Oxford Street, complete with cobble stones and abandoned Victoria stores. The secret street can be allegedly accessed via the basement of shops, including Forever 21 and Selfridges. You might be thinking why I am writing a blog about Oxford Street in London – well, after 10 years of being (proudly) located in Southampton, GottaBe! has decided to find ourselves a second home just here – on Oxford Street in London. You’ve heard it right – GottaBe! as well as having offices in Southampton, now will be present in the heart of the City (or The Big Smoke as some like to call it!). 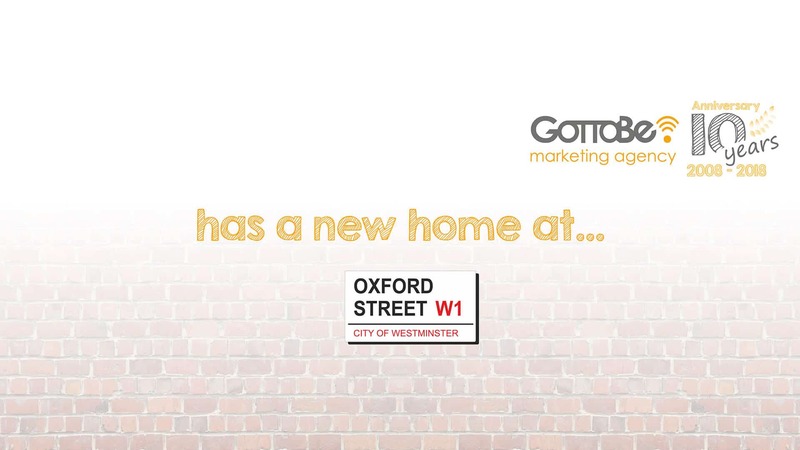 Either way, alight at Oxford Circus for new home of GottaBe! As we continue to expand as an agency and work with more and more London based Clients, it only makes sense from the business prospective to get an office in the City and be part of the vibrant, fast paced and ever-changing community. We have picked Oxford Street as with over 10 tube stations within 15 minutes’ walk of our new office and access to every line of the London’s underground system, my team and I will be able to get to all of our current and prospect Clients in a jiffy. Also, should you wish to pop by to see us, you will find yourself only seconds away from the theatre land, Soho, China Town, countless museums, National Gallery or even the oldest cinema in Britain – The Regent Street Cinema that was built in 1848. We are located within Jubilee House at 193 – 211 Oxford Street – a newly opened co-working space above JD Sports with a few other creative agencies already based there or moving in very shortly. The London office will be an addition to our Southampton HQ. My team and I look forward to welcoming you to our new office and having a cup of tea, coffee, beer, wine or G&T with you! Blog written by Tomasz Dyl, Managing Director of GottaBe!